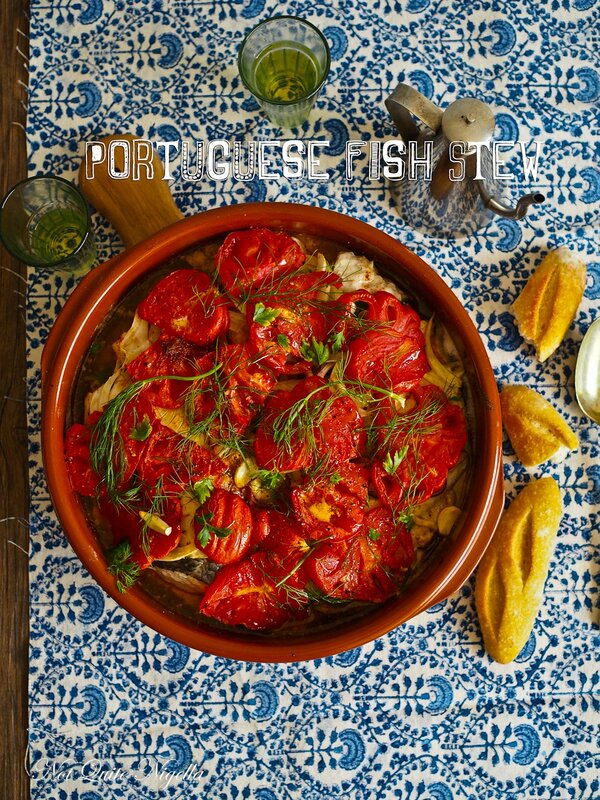 Caldeirada is a Portuguese summery, crowd friendly dish to serve dinner guests. 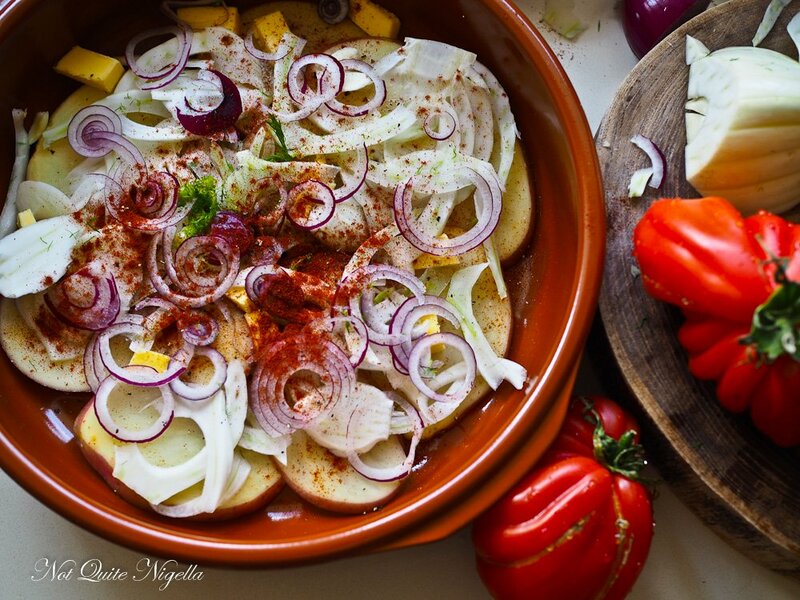 It's a layered dish starting with tender potatoes, onion, thinly sliced fennel and juicy red tomatoes with a variety of fish fillets. It is simple, which is when seafood is best and requires just 15 minutes of prep! 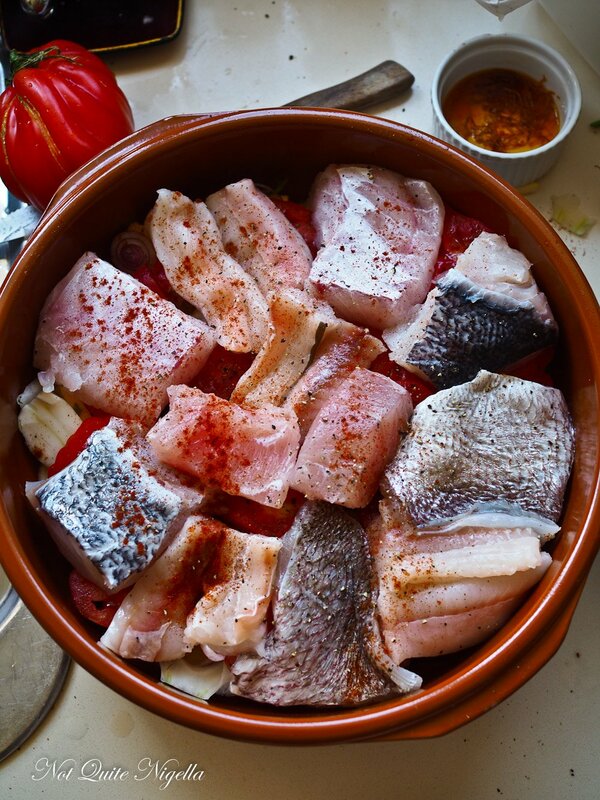 This dish is said to be a cousin of the French Bouillabaisse and it's best when you've got a variety of fish fillets and you want to make a large dish to feed many. The reason I had an abundance of fish was because I had bought a lot of different types for my allergy test. I haven't been interested in cookbooks much lately but this one by Portuguese chef Nuna Mendes caught my eye as it needed just as much fish as I had. 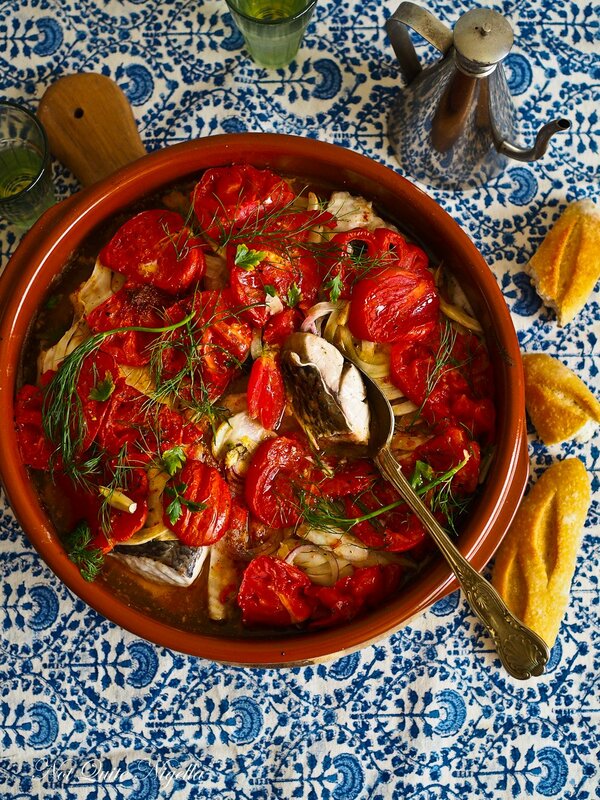 It was a generously portioned fish stew that featured layers of potatoes, tomatoes, onion and fennel as well as fat, pillowy fillets of fish. The reason why I had to buy so many different types of fish was because allergy tests only generally deal with half a dozen types of seafood but I wanted to make sure that I wasn't cutting out any seafood that I didn't have to so I found myself a great allergist who understood completely what I needed and gave me a clear plan. She even offered to go to the fish market for me to get the items. But because seafood stores don't sell sample sized pieces of fish I had to buy fillets which meant that I had a huge amount left over after I cut off a tiny sliver. The scratch test involves using compounds of common allergens like dust mites, grass etc as well as a small range of food allergens. But you can also do the scratch test with seafood simply by sticking the plastic "scratcher" into the seafood. 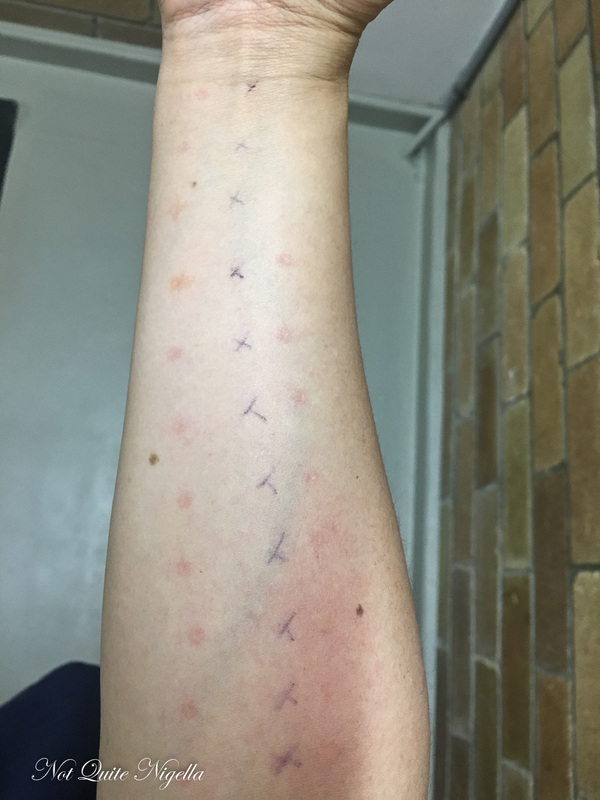 The allergist marks your arm and presses the scratcher into your skin (it looks much more painful than it is) and within 15 minutes you will get a result. The doctor proceeded down both my inner arms on each side of the crosses and then I waited. There was one that swelled up a bit and that was the control of the histamine and was to be expected. The other one swelled up to three times its size. That was a dust mite which I know I'm allergic to. And then I waited. Fifteen minutes went by and I looked at my arms. I only had the slightest swelling on one arm and that was for barramundi, a very common fish in Australia. The doctor explained that barramundi is often the culprit here especially if it is just the one fish that people are allergic to. But it was good news-all my favourites like crab, prawn, oysters, salmon were all not reacting! And then we did a blood test testing out other types of fish that aren't easily found in Australia and that was negative too! We discussed at length at what it could be. She thinks it's quite likely that it could be something specific to Peru as they have a lot of indigenous products as well as fish from the Amazon. But at least here I can now eat seafood with the exception of barramundi. I do have to be careful of unique local species of fish when I travel and I've got a prescription for two additional Epi pens just in case. Th doctor explained that each type of seafood should be first tried by itself and not in combination with other seafood just to see if there is a reaction. However it's been almost a week and I'm still too scared to eat seafood just in case something happens again. I looked at some prawn katsu today but then scurried away quickly as if it could bite! So tell me Dear Reader, are you allergic or sensitive to any foods or things like grass or dust mites? Have you ever had a scratch test? Do you have a favourite seafood that you would eat first? Step 1 - Preheat oven to 180C/350F. Soak the saffron in the water. Rub the base of your pot with the halved garlic clove. Then line with half of the potato and top with half of the butter and season with salt, pepper and smoked paprika. Then add half the onion, garlic, half the fennel and half of the tomatoes seasoning with salt, pepper and smoked paprika. Step 2 - Add the fish fillets and a layer of onion, potato, garlic, fennel and tomatoes and more salt, pepper and smoked paprika. Dot with the rest of the butter, drizzle with olive oil. Mix the saffron water and threads with the wine and pour over. Cover with foil and bake for 20 minutes. Remove the foil and bake for another 20 minutes. recipeFather's Day BBQ Plank Salmon & Broccoli Bacon Salad! recipe Father's Day BBQ Plank Salmon & Broccoli Bacon Salad!